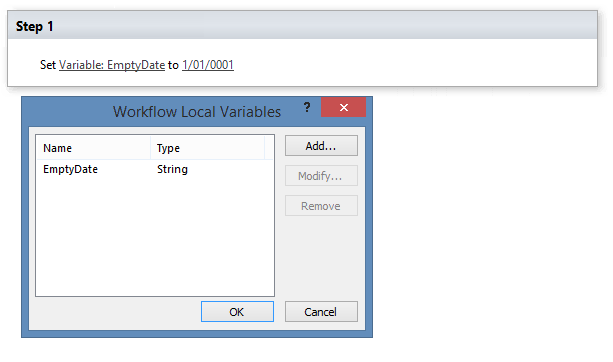 It seems to me that for some utterly stupid reason, it seems as though one cannot clear a date time field using a workflow, although one can clear it manually in the user interface. Makes absolutely no sense. I have tried creating a date and time field (empty date) with a default value of none that always stays empty, and I assign it to a workflow variable, and use that variable to assign a value to a date time field on another list. It does absolutely nothing. Workflow works, no errors, does everything else but it simply ignores the empty value that I am trying to set it with and keeps the existing value in that field as if nothing happened at all. Log messages to workflow history tell me the logic is correct and I get to the spot where I should be, but it just quietly does nothing. No errors. I tried using duplicate date fields that are calculated columns returning a string and get their value from the original date field, so that maybe I can use strings for display on the other list instead of dates and it will let me clear the string version of the date but the calculation just converts it into a long number. I could format it to show as date time format in SharePoint, but the list that the workflow is setting values on is meant to be exported as an excel spreadsheet, so I don't know if that column formatting will stick when it's in excel and whether I'll instead get the long number again. It seems to me that Microsoft in their infinite wisdom has successfully made what I want to do impossible. And why? Again, you can clear it in the UI no problem, so it's not like it can't be done. It's just one of those many completely annoying botches they always seem to make for completely unexplainable reasons. Has anyone else had success doing this using 2013 workflow on SharePoint online 2016? If so, please share. Thank you. Not the answer you're looking for? Browse other questions tagged list workflow date-time or ask your own question. What does SharePoint date-time field contain by default?